Here's a cool little postcard poem wishing you all the luck o' the Irish for St. Patty's Day 2011. 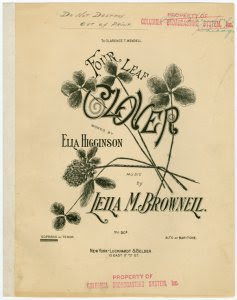 Printed to look as if it were written out by hand, "Four-Leaf Clover" is signed by its author, poet and short story writer Ella Higginson (1861-1940) who was born in Kansas, grew up in Oregon, married in Portland, and later moved to Washington state where she became active in civic and political affairs. On the subject of divorce, she wrote, for example, the "real evil was not that divorce was too easy, but that marriage was too easy, and that there should be a law preventing marriage before the age of thirty." Higginson was named Poet Laureate of Washington State in 1931, a post that was apparently eliminated sometime thereafter but officially brought back to life in 2011 with the appointment of Samuel Green following passage of Washington Substitute House Bill 1279. Higginson's papers—18 boxes of them at least, all awaiting scholarly investigation—are now at the Center for Pacific Northwest Studies located at Western Washington University in Bellingham. We here at P&PC like the look of this postcard for a number of reasons, starting with its appearance of having been personally handwritten by Higginson herself (pictured here), whose facsimile autograph stands in lieu of a commercially printed byline and copyright notice. This handwritten front, we think, encourages the postcard's user to view the writing of his or her own personal handwritten message on reverse as poetic in orientation as well—an invitation that this particular postcard's (unidentified) user seems to have accepted. "This is a beautiful thought," he or she writes in pen to an unnamed recipient, "and I want you to just try out this thought for yourself, and don't get nervous or to [sic] tired, 'for quietness and confidence shall be your strength.'" Those of you who read your Bible don't need to be told that the phrase "for quietness and confidence shall be your strength" is from Isaiah 30:15; what's kind of cool, though, is how the sender is perhaps motivated to quote scripture by Higginson's own allusion to 1 Corinthians 13 in "Four-Leaf Clover" ("One leaf is for hope, and one for faith / And one is for love, you know"). As both writers sample and thus personalize Biblical passages, we have a really funky bit of communication in which the sender uses his or her own Biblical reference (Isaiah) in conjunction with Higginson's poem and its Biblical reference (Corinthians) to encourage the recipient to "try out this thought for yourself," which is pretty much an extension of the invitation we think the handwritten look of the postcard presented in the first place. 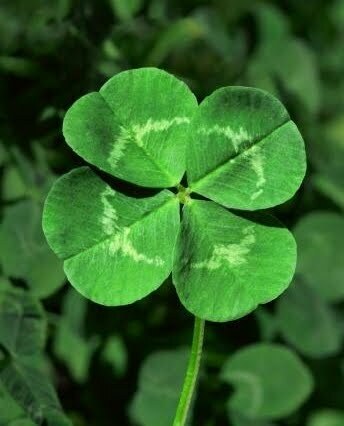 It is fair to say that "Four-Leaf Clover" got around. According to one source (1911's Studies in Reading by James William Searson and George Ellsworth Martin), "no other little gem of the language has been more widely appreciated and more warmly loved." Apparently, it was written in 1890 and published in Portland's West Shore magazine. Then it was published in McClure's (1896), The Outlook (1898), the Northwest Journal of Education (1898), Friends' Intelligencer and Journal (1898), American Cookery (1899), Oregon Teachers' Monthly (1902), the Journal of Education (1911), and Sunset (1918). 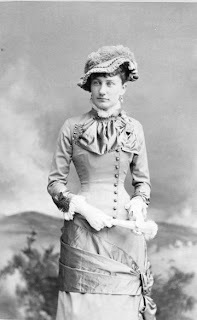 Higginson included it in her book of poems When the Birds Go North Again (1899), and it was reprinted in Annie Russell Marble's Nature Pictures by American Poets (1899), Edmund Clarence Stedman's An American Anthology (1900), The Listening Child (1903), Robert Haven Schauffler's Arbor Day (1909), The Home Book of Verse (1912), and a range of school readers and publications for educators. It was also, Searson & Martin report, put to music "by at least fifty composers." This is what happens when you don't copyright a poem: it goes viral. May you be so lucky this St. Patrick's Day. Out of the Taxi and into the Office: Melissa Girard Reviews "What Poetry Brings To Business"
Brian Reed's "The People, Yes, Thirties Modernism, and the Problem of Bad Political Poetry"
Carriers' Addresses @ Brown U.
Claudia Schaefer-Rodriguez on "Peace, Poetry, and Popular Culture: Ernesto Cardenal and the Nicaraguan Revolution"
George Orwell on good bad poetry in "Rudyard Kipling"
George Orwell's "Poetry and the Microphone"
Interview with David Trinidad on "Pop Culture & Poetry"